The second Guild Wars 2 beta weekend is this weekend. 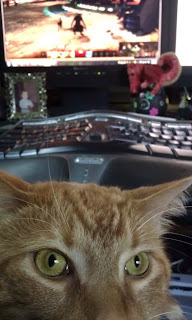 That means a lot of this: A cat wondering why I'm playing with a "cat" (Charr) on the computer and not him. In the afternoon I took a quick break to start in on my first Arduino project: Snail Mail Notifier (Chris had mentioned this as a possible project). 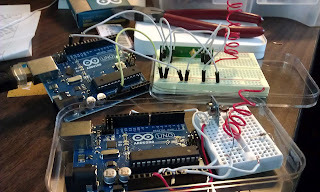 Up until now I've just been reading about coding and wiring, making various LEDs blink. But now, it's time to try something else. This is not a project I designed or coded myself. I got partially through designing it and discovered someone else had already created what I was basically thinking about doing. What you do is set up two Arduinos, one in the mailbox and one connected to your PC. 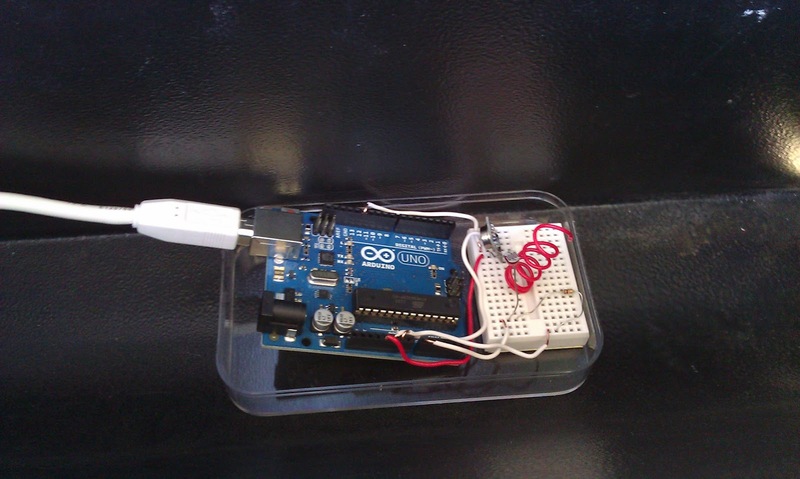 The mailbox Arduino registers that the mailbox has been opened (via a light sensor). When that happens it sends a message via RF to the PC Arduino. The PC Arduino plugged into the computer then prints a message on your computer saying you have mail. Obviously the setup isn't the best. First off I'd ideally like to use just one Arduino not two. Second, I'd like to have mail notification via email or text message, not a serial monitor window on my computer. Third, as you can see, I do not have a battery pack hooked up to the receiver in the mailbox or the enclosure sealed against the elements. The local Radio Shack was out so to test this I had to plug a USB cable into a wall adapter inside the house. Still, this is a start and it's a way to see new libraries and codes in play that I haven't used yet. There's another project that uses a push button and a php server to send notifications via the internet - Snail Mail Push Alert. I have a few parts on order for that project and a cat toy. What I'd ideally like to do is combine the best of both (wireless + push notifications), but I don't think Chris is sold on this device's usefulness (it's not like you don't check the mail everyday anyway, right?). Someday I hope to create an automatic curtain opener for no reason other than because.